differential is installed in the banjo housing. The axle banjo housing should be free of debris from the previous differential. Metal debris from the previous differential will contaminate the oil and may damage the rebuilt differential. When installing a FRONT DIFFERENTIAL WITH A POWER DIVIDER, the ring gear teeth will generally face toward the DRIVER’S SIDE of the vehicle. Some differentials – especially older models – have EARS ON SIDE ADJUSTER RETAINING CAPS. These may need to be GROUND DOWN to fit into your axle housing. In applications with tandem axles, any significant DIFFERENCE IN TIRE WEAR OR SIZE from front to rear will cause premature wear to the power divider. Engaging the inter-axle lock with mismatched tires may cause damage to either or both differentials. All differentials must use oil that is designated as EXTREME PRESSURE (EP) API GL-5. 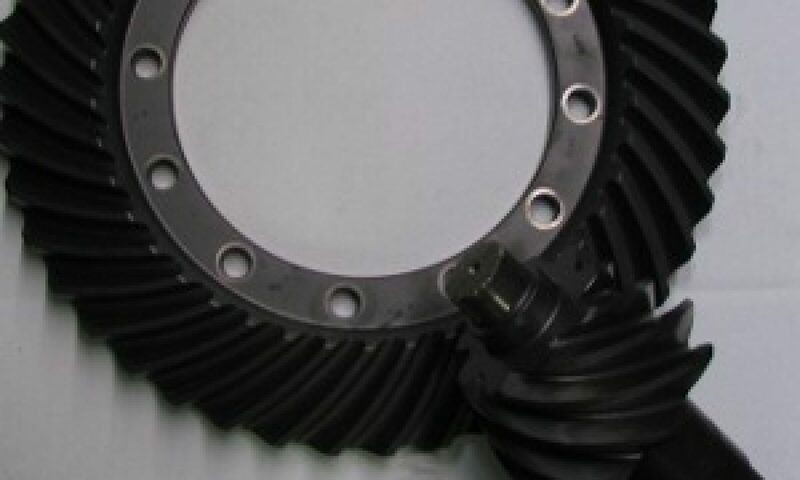 This is necessary to protect the ring and pinion gears from premature wear. Failure to use proper lubrication can cause ring and pinion failure in a matter of weeks. The power divider inter-axle lock is intended for temporary operation when the vehicle is operating in poor traction conditions. Driving the vehicle when the inter-axle lock engaged for extended periods or in good-traction conditions can cause damage to either axle. The inter-axle lock should only be engaged when the vehicle is not moving and when the wheels are not spinning. Engaging the inter-axle lock when any wheels are spinning can cause severe damage to either axle. Make sure the differential yoke nuts are tightened to the manufacture’s torque specifications. Failure to do so may damage the pinion seal or bearings, or cause premature wear. Certain Navistar/International applications use a reversed air system for the differential lock. If the vehicle you’re working on is an International, verify how the air for the inter-axle lock operates and make sure the replacement differential is the same. On two-speed differentials it is very common for the failed two-speed parts to damage the electric shift motor. The damaged shift motor can in turn damage the rebuilt two-speed differential. Inspect and test the electric shift motor before installation.